Actor Dwayne Lau's outfit rocks. The 35-year-old went as Mia, the character played by Hollywood actress Emma Stone in the hit movie musical La La Land, with a stone on his head. The lightweight plastic prop was part of his mother's house decorations. For his look, which chanelled old Hollywood glamour through a bright yellow flowy dress, curled red hair and his personal paparazzo, Lau took home the Best Dressed prize. He won a dinner voucher for two at Beast & Butterflies restaurant at M Social Singapore. The prize, which comprises a three-course meal with wine and is worth $200, is sponsored by M Social Singapore. He chose to appear in drag also to represent La Cage Aux Folles, the Wild Rice musical about a cabaret in Tanjong Pagar that he is acting in. It runs from next Wednesday to May 13. In keeping with the night's theme of Lah Lah Land, his outfit had a local twist. He wore a necklace made of yellow five stones that he had made himself. Mia's bright red bag and black-and-white tap shoes were bought here. Lau says: "Cheaper versions lah. My shoes are from Mustafa Centre." Here are five other highlights spotted at the theatre awards. Four of the five judges for the Best Production For The Young award pulled out all the stops to appear as characters from the classic musical, The Wizard Of Oz. "We're looking for Dorothy, can't you see?" says independent theatre practitioner Tan, who is dressed as Cowardly Lion. 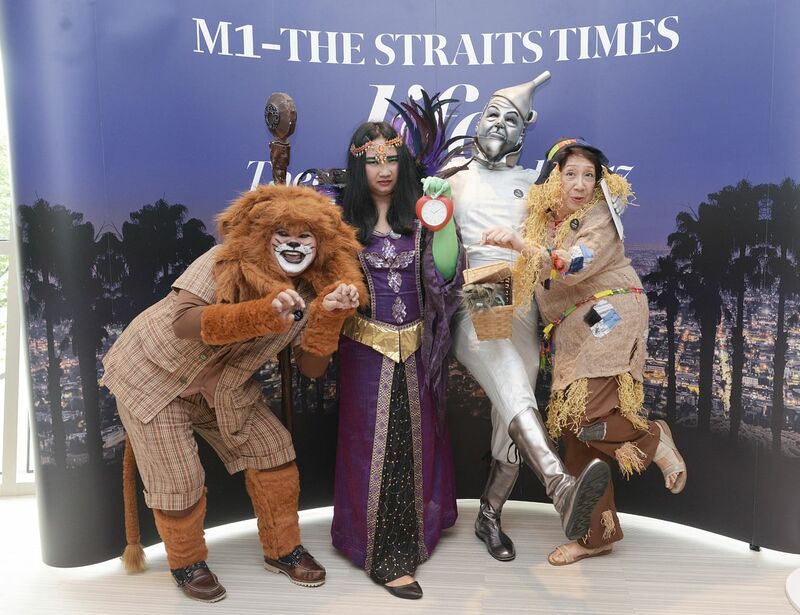 There was also Tin Woodman (Act 3 Theatrics founder Chandran), Scarecrow (arts educator Ferroa) and the Wicked Witch Of The West (The Straits Times correspondent Lee). Their outfits were from Moephosis Concepts, a costume boutique run by costume designer Moe Kasim. The fifth judge, Chinese writer Chong Yuan Chien, was unable to attend the ceremony. But Dorothy's dog was in attendance, or at least a stuffed toy version of it, hidden in a small wicker basket. Tan says: "We have Toto here. He's very well-behaved." 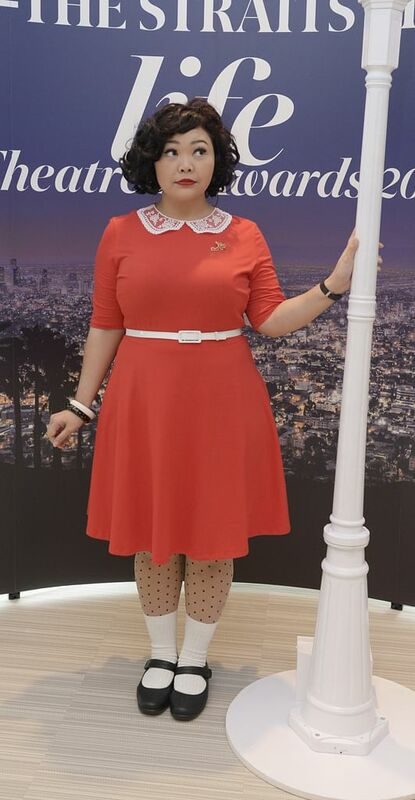 Actress Siti, 32, was cute as a button as orphan Annie from the musical of the same name. She wore a red baby doll dress with a white Peter Pan collar. Her black hair was curled to look like Annie's mop of tight curls. "So with this outfit, I think I can be this year's National Day Parade mascot," says Siti with a laugh. Annie is one of her favourite musicals. Both she and actor Dwayne Lau had their hair and make-up done by Haslina Ismail, a make-up artist Siti last worked with for Those Who Can't, Teach, a play by The Necessary Stage. Siti will next appear in Tropicana The Musical, which opens on Thursday. Towards the end of the ceremony, Siti's hair, held up by hairpins, threatened to unravel. "That's why I call myself Annie How," she quips. 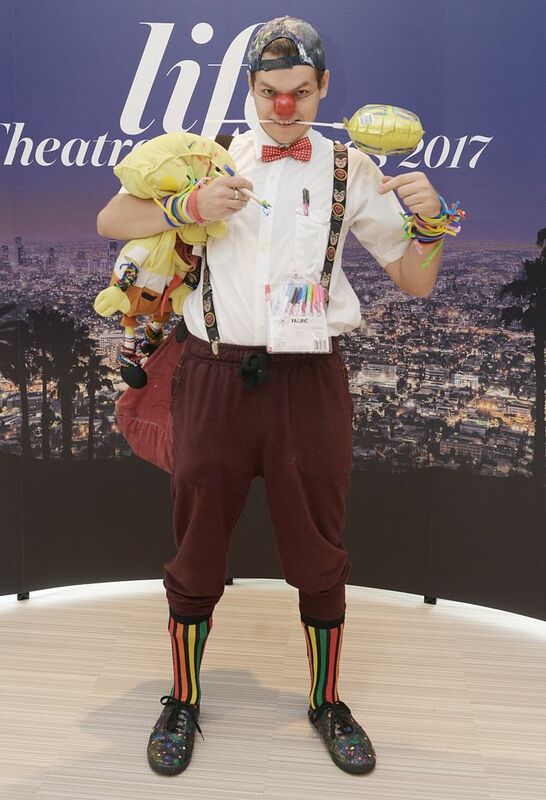 Australian actor Lagos, 25, played the clown in his costume. He dressed up as Burrs, a vaudevillian clown from the off-Broadway musical, The Wild Party by Andrew Lippa. Lagos attended the awards as a nominee for Best Ensemble for Rent by Pangdemonium. He will next play Patrick the nightclub host in Tropicana The Musical, which opens tomorrow. Lagos wanted to set himself apart from the sea of fancy dresses and suits - similar to those from the movie La La Land - that he expected most people would be in. "But The Wild Party was set in a similar time with an emerging jazz scene and that party sentiment," he adds. His costume came complete with a red nose, multi-coloured bracelets and a SpongeBob SquarePants stuffed toy. He also wielded a packet of markers, inviting other guests to draw on his white shirt. He says: "I want to bring a bit of colour and fun to the party, so everyone will feel a little bit less awkward." Beautiful in batik was Malaysian actress Tan, who was inspired by the old P. Ramlee musicals of the 1950s and 1960s. The 28-year-old was wearing a batik tube dress from Baju by Oniatta, a new fashion label by Singaporean theatre educator and actress Oniatta Effendi. The label launches here next month. "We celebrate recent local musicals, but we aren't really putting on Menceceh Bujang Lapok 50 years later," says Tan, referring to the tune sung by P. Ramlee. She will next appear in Forbidden City, by the Singapore Repertory Theatre and the Esplanade, alongside Kit Chan as Empress Dowager Cixi. The production opens in August. Tan plays a younger version of the empress. She performed the song My Only Chance from the musical at the awards ceremony. Her dress fit her "fusion-inspired aesthetic". The material is batik tulis, a traditional type of batik, and bears a peacock design. "I love the flare and colour. I spent a good amount of time looking at my skirt. I was distracted by my own dress," she says with a laugh. Most guests could not tell that actress Wee was dressed as street urchin Eponine from the hit musical Les Miserables. "I said, imagine me looking more beat up," says Wee, 32, who wore a beige trench coat with a pair of matching pants and a red beret. She will be performing in The Car by Verena Tay, an Our Company production in July, as part of the Esplanade's Feed Your Imagination series. She says she loves Les Miserables. "Eponine is my dream role," she says, adding, though, that she actually does not do musical theatre. "I used to sing the songs in the car with my family," she says, referring to tunes such as Lovely Ladies, which is about prostitutes who ply their trade by the docks. "I was little and didn't understand what it meant."